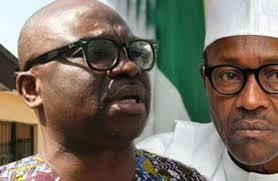 The Ekiti State Governor, Ayodele Fayose, has described the increment in the pump price of petrol as one of the gifts of President Muhammadu Buhari to Nigerians to celebrate his one year in office, describing the president’s one year in office as “a colossal waste”. The statement reads; “Despite his electoral promise to reduce petrol pump price from the N87 per litre that he met it, President Muhammadu Buhari increased the price to N145! With this increment, Buhari has further impoverished Nigerians. “Nigerians should be reminded that on April 14, 2015, President Buhari’s ally and former Minister of Petroleum and Energy, Prof. Tam David-West, told Nigerians that Gen. Mohammed Buhari (who was then President-elect), will reduce the fuel pump price from N87 to N40 per litre. Buhari did not debunk this statement made by his friend and major supporter. “In rewarding Nigerians for electing him as president, President Buhari opted to increase petrol pump price by N58.50! “The first justification of the increment was removal of subsidy. But Nigerians were later stunned when the Vice President, Prof Yemi Osinbajo said pump price of petrol was increased because Nigeria was broke! “In other words, President Buhari increased petrol pump price because the country was broke and it needed to shore up its revenue base. The N58.50 added to the previous pump price of N86.50 was an Indirect Tax imposed on each litre of petrol purchased by Nigerians. “Simply put, the Federal Government is indirectly collecting N58.50 naira tax from suffering Nigerians on each litre of petrol they buy. Buhari is no doubt acting like the proverbial Agbalowomeri Baale Jontolo (Aking that exploit his extremely poor subject to further enrich himself). “It is on record that on May 2 this year, the federal government, in the Petroleum Product Pricing Regulatory Agency (PPPRA) Template released in Abuja, told Nigerians that it was subsidising petrol at N12.62 per litre. “In 2012 when the Dr Jonathan removed fuel subsidy and increased petrol price to N141 per litre, crude oil was selling at $111 per barrel. “If not wickedness, how can petrol price be increased to N145 per litre when crude oil is now selling at $49 per barrel? “Increasing petrol pump price by N58.50 when the federal government claimed it was subsidising the product at N12.62 per litre is clear wickedness on the part of President Buhari. “In the history of Nigeria, increase in price of petrol has never been as high as it was done by Buhari, putting Nigerians in severe hardship as the product affects every sector of the economy. “Too bad, those who opposed removal of fuel subsidy in 2012 and funded the Occupy Nigeria protest are the ones canvassing support for this Buhari’s wicked one year anniversary gift to Nigerians. “The labour unions are now completely cowed, dashing completely hope of the common people of Nigeria. “Interestingly, this is not the first election promise by APC/Buhari that have been jettisoned since they got into office. The N5,000 unemployment benefits promised the downtrodden was derisively put down by this President as “largesse” with the president spurning the emotional plea of his own wife to the contrary. To add salt and insult unto injury, he traveled abroad to make the statement. “Despite the mindless and indefensible hike in fuel price, the commodity is still not available. Minister of state for Petroleum says there is no forex to pay for fuel import; yet there is forex to indulge Buhari’s foreign-trip profligacy. “Presidential spin doctors and APC chieftains labouring to hoodwink the people speak glibly of how so-called deregulation will make products available, reduce cost through competition and the interplay of market forces as well as encourage private sector to build more refineries. But thank God who loves Nigerians so much, the lies of these people was by divine arrangement, I suppose, revealed by no less a person than the junior minister Ibe Kachikwu himself when he said importation of fuel continues till 2019. “Nigerians should be reminded that the manner of hardship being faced now was also faced during Buhari’s first coming as a military dictator when people had to queue for essential commodities. Now, Nigerians can’t even afford common tomato to prepare soup. “So Nigerians you have heard the truth: Under Buhari/APC, it is almost certain that our suffering will continue till 2019.